Discover the Nutrition information of McDonald's. If you don’t find your country, click here . 1. You may, subject to paragraph 7, download the materials contained in or displayed on the Site and print off pages of the Site for non-commercial use only (and for this purpose fair dealing with any such materials for the purpose of criticism or review or the reporting of current events purposes is a ‘non-commercial’ use) provided that (a) you do not remove or alter any copyright and other proprietary notices contained on the materials (b) all use is for lawful purposes only and (c) acknowledgement of the source is given. Except for the purpose of fair dealing as stated, neither the content of the Site nor any part of it may be distributed, reproduced, modified, transmitted, reused, re-posted or used for public or commercial purposes without McDonald’s prior written permission. 2. If you download any software from the Site, the software, including all files, images, contained in or generated by the software and accompanying data (together, the "Software") are to the extent owned by McDonald’s (but not otherwise) deemed to be licensed to you by McDonald’s on the basis that (a) neither title nor any intellectual property rights are transferred to you, but remain with McDonald’s (b) you may not resell, decompile, reverse engineer, disassemble or otherwise convert the Software to a human perceivable form and (c) either of us may terminate the licence at any time immediately with or without notice and on such termination you must destroy all materials including (but not limited to) the Software obtained from the Site and all copies. 3. 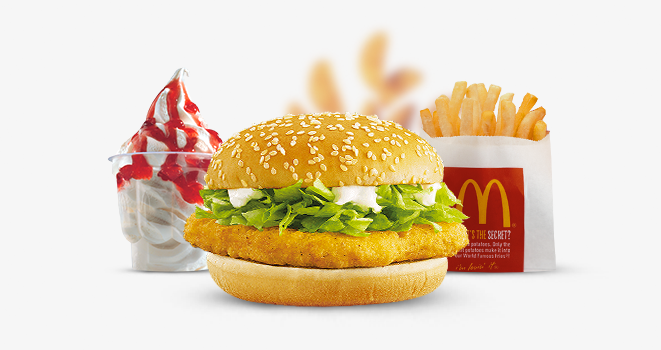 The Site and the content, functionality and design of the Site is protected in the UK and elsewhere in the World by copyrights, trade marks, designs and/or design rights and other intellectual property rights either used by us under licence from a third party or owned by McDonald’s or a member of the McDonald’s Family; by this expression, we mean McDonald’s Corporation and each of its subsidiaries, together with their respective franchisees and certain selected companies (which are either our partners who perform a function or agencies and suppliers whom we have retained (by way of non-exhaustive illustration) to host our website or toprovide technical assistance and support and perform other functions to support our activities). None of the Site, the Site content, the Site functionality or the Site design, nor any part of any of each, may be used in any manner whatsoever, except either as provided for in these Terms and Conditions or in the text on the Site or within the strict terms of the written permission of McDonald’s obtained for the proposed use in advance of such use (and in respect of which McDonald’s neither warrants nor represents that your proposed use will not infringe any third party rights). 4. The materials contained in or displayed on this Site are provided "as is" and without warranties or representations of any kind either expressed or implied. McDonald’s disclaims all warranties of satisfactory quality and fitness for a particular purpose. McDonald’s does not warrant that the functions contained in the materials will be uninterrupted or error-free. 5. To the extent permitted by law, McDonald’s will not be liable for any damages or injury howsoever caused including, but not limited to, any failure of performance, error, omission, interruption, defect, delay in operation of transmission, computer virus, interception of data, or line failure. McDonald’s will not be liable for any damages or injury that result from the use of, or the inability to use, the materials in the Site howsoever caused. 6. McDonald’s and any other party involved in producing or delivering the Site assume no responsibility, and shall not be liable for any damage to, or viruses that may infect, your computer equipment or other property on account of your access to, use of, linking to or browsing in the Site or your downloading of any materials, data, text, images, video or audio from the Site. 7. The trade marks and logos (the "Trade Marks") displayed on Site include the registered and unregistered trade marks of the McDonald’s Family and of other businesses. Nothing in these Terms and Conditions or on the Site may be construed as granting any licence or right to use any of the Trade Marks without the prior written permission of McDonald’s or other proprietor of the Trade Marks. Any use of the Trade Marks or any other content on the Site except as provided in these Terms and Conditions is strictly prohibited. 8. McDonald’s has not reviewed any sites linked to the Site and is not responsible for and does not endorse the content of any off-site pages or any other sites linked to the Site. Your linking to any other off-site pages or other sites is entirely at your own risk. 10. Any exclusion or restriction of liability contained in these Terms and Conditions shall apply only to the fullest extent permitted by the laws of England. 12. Any use of the Site shall be subject to the laws of England and any dispute arising from such use or otherwise in connection with the Site shall be subject to the exclusive jurisdiction of the courts of England. 13. McDonald’s, the Golden Arches logo, Happy Meal and Ronald McDonald Name and Design are trademarks of McDonald’s Corporation and its affiliates. McDonald’s Europe Limited is a company registered in England at 178-180 Edgware Road, London, W2 2DS with number 1739890.